Left 4 Dead 2 is a cooperative first-person shooter video game developed and published by Valve Corporation. 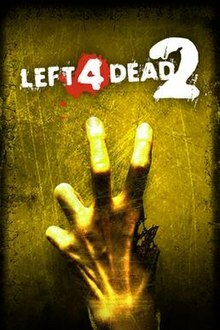 The sequel to Turtle Rock Studios's Left 4 Dead, the game released for Microsoft Windows and Xbox 360 in November 2009, and for OS X in October 2010, and for Linux in July 2013. 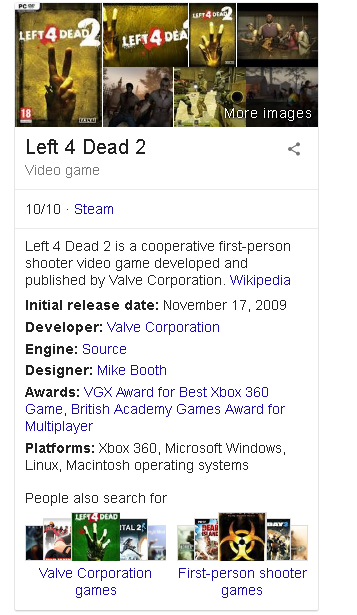 Left 4 Dead 2 builds upon cooperatively focused gameplay and Valve's proprietary Source engine, the same game engine used in the original Left 4 Dead. Set during the aftermath of an apocalyptic pandemic, Left 4 Dead 2 focuses on four new Survivors, fighting against hordes of zombies, known as the Infected, who develop severe psychosis and act extremely aggressive. The Survivors must fight their way through five campaigns, interspersed with safe houses that act as checkpoints, with the goal of escape at each campaign's finale. The gameplay is procedurally altered by the "AI Director 2.0", which monitors the players' performance and adjusts the scenario to provide a dynamic challenge. Other new features include new types of special infected and an arsenal of melee weapons. The game made its world premiere at E3 2009 with a trailer during the Microsoft press event. Prior to release, it received a combination of positive and negative critical and community reactions. It attracted an unusually high volume of pre-release controversy about the game's graphic content. In response, alterations were made to the cover art and both Australia and Germany refused to rate the unmodified edition at the time of release. After release however, the game was met with positive reviews by critics.